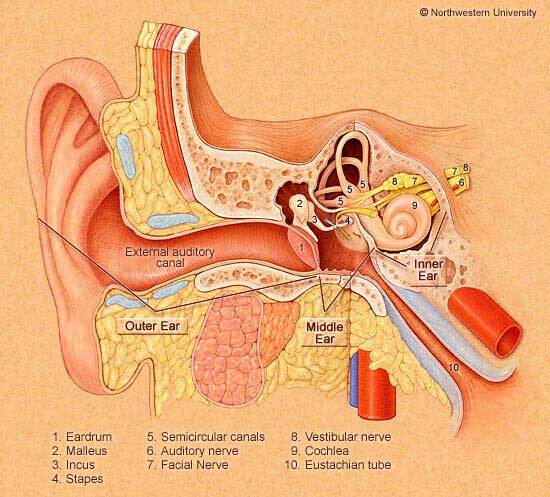 While there are several other surveys of inner ear anatomy, we have diffidently here set out to put the content in our lecture on this subject on the web. The semicircular canals are very small rings -- about 1 cm in diameter. The image above is an MRI of a normal set of inner ears, taken in the "axial" view. The snail shaped objects at the top (front of head) are the cochlea. The rings are the semicircular canals. 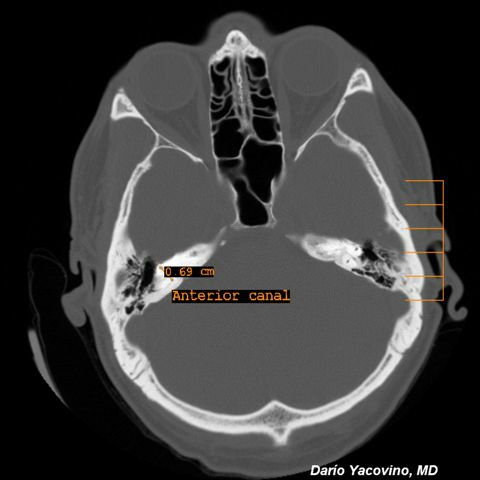 The image above is taken from a CT scan shows that the anterior canal diameter is less than 1 cm - -smaller than a dime ! There are three semicircular canals - -the anterior, superior and horizontal. Between the three canals the brain can determine rotational velocity in three dimensions. There are also two otolith organs (click here for more). The otoliths respond to linear acceleration such as gravity or changing velocity of movement in a straight line.